When a data input occurs, for example, when an operator reads a barcode with the barcode reader, the input device sends the input data to the TM intelligent printer. The TM intelligent printer formats the input data received from the input device and sends the data to the Web server application (POST). Triggered by the input data, the Web server application generates device control data in ePOS-Device XML format from a database or other system and returns a response to the request from the TM intelligent printer. 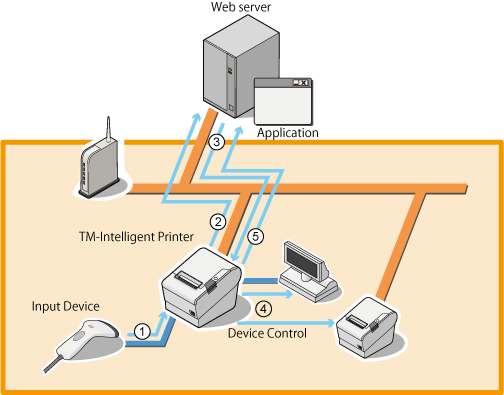 The TM intelligent printer sends the device control data to the device. The TM intelligent printer sends the result of device control to the Web server.